We are happy to announce that UberConference is one of the four startups chosen to present by Enterprise Connect at its Innovation Showcase. Enterprise Connect is the leading conference and exposition on enterprise communications and collaboration and is taking place in Orlando, Florida March 18-21, 2013. UberConference provides those on a teleconference with a broad range of easy-to-use tools that increase the usefulness and productivity of a group call. UberConference will present at Innovation Showcase at 1 p.m. ET Monday, March 18 located in Osceola C.
With its unique, visual interface, UberConference shows participants who’s on a call and who’s speaking at any given moment, provides document sharing through Box and Evernote, and gives all participants access to every other participant’s Google+, LinkedIn, Twitter, and Facebook public social profiles. As one of the earliest adopters of the highly anticipated WebRTC standard, UberConference users can “dial into” UberConference calls directly from their Chrome browser. UberConference is also available for both iPhone and Android. 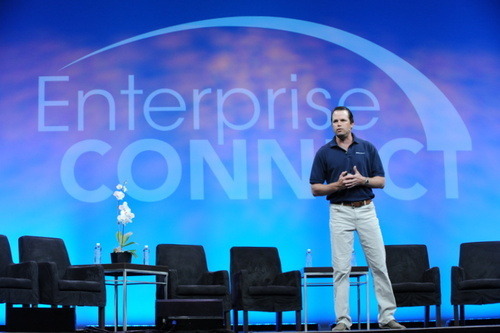 Enterprise 2013 will focus on wireless, video, Unified Communications, WebRTC, SIP Trunking, and the Cloud. The Enterprise Connect Innovation Showcase is designed to feature innovative products and services from new and emerging start-up firms in these areas.